Brett Johnson was born and raised on a cattle farm near Aukland in New Zealand. 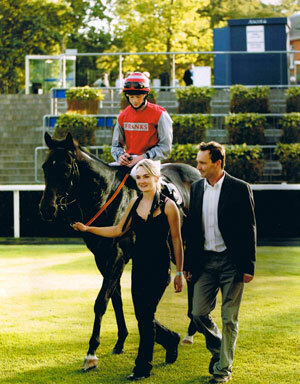 Brett and Vanessa walking to the winners enclosure with Elna Bright at AscotBrett has a family background in horses and horse racing, as one of five children he won champion rider titles in the showjumping ring while his elder brother Peter was champion jockey in New Zealand for ten years. His sister is a successful racehorse trainer in Australia, while his father is a racehorse trainer in Singapore. Brett himself won 364 races on both the flat and over fences in Australia before coming over to England and riding for a number of trainers before retiring from race riding and becoming assistant trainer to Geoff Lewis for eight years. 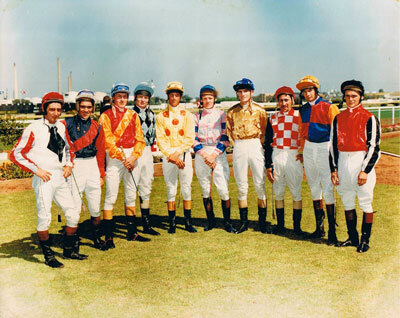 Brett in his younger years as a jockey in Australia After gaining valuable training experience and managing Geoff Lewis's overflow yard , Brett took out a dual trainers license of his own in 1998. Since then he has enjoyed many successes in both flat and national hunt races. Brett has always trained within the racing community of Epsom, but has recently moved location, stabling his horses in the historic Cicero yard of The Durdans Stables. Epsom is famous for its horse racing history with the Derby having formed the centre of the boroughs social calendar since 1779. Horses working on one of the sandtracks on Epsom DownsEpsom houses the third largest training facility in the country. Epsom Downs racecourse is situated on Epsom and Walton Downs. The Downs is an area of 600 acres of unspoilt downland where on a clear day you can see a panoramic view of London. Epsom Downs training ground hosts 85 miles of grass and all weather tracks including a five furlong fibre sand gallop, four furlong poly track and a nine furlong Mac Track, as well as schooling fences and hurdles. Our horses are stabled in the famous Cicero yard of The Durdans Stables which dates back to the 19th century and is named after one of Lord Rosebery’s three Derby winners (see History for more information). 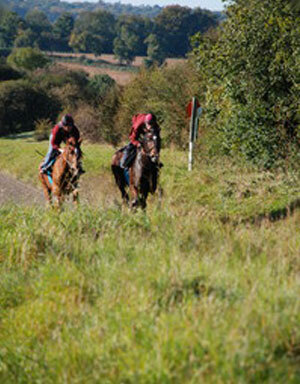 The Durdans are situated on a quiet lane used only by local traffic, with access directly onto the Downs. The Durdans was designed by George Devey for Lord Rosebery in 1881 and is the oldest racing yard standing in Epsom. Lord Rosebery was a well known horse breeder and racehorse owner. The Durdans Stables have been described as being the 'finest in the country' (The Victorian Dictionary compiled by Lee Jackson). The grade 2 listed sand school is a wonderful example of the arts and crafts movement and has been described by Caroline Baldock as the 'star in crown of this delightful equestrian establishment'. Racing and winning was part of family life for Lord Rosebery and his wife Hannah Rothschild at Epsom. Amoungst the most famous horses ever to have been present on the yard were Ladas, Sir Visto and Cicero, who won the Epsom Derby in 1894, 1895 ad 1905 respectively. Cicero, Sir Visto and Ladas are buried in the grounds of the Durdans along with Amato, Derby winner in 1838 who belonged to the former owner of the Durdans, Sir Gilbert Heathcote. The graveyard has been recently restored, so is worth a visit! Rosebery stated “I feel guilty winning the Derby for the third time as most owners do not get the chance to win once”. After this tremendous achievement the Cicero yard at The Durdans Stables became famous and tributes were created around Epsom, varying from naming public houses to a horse trough carrying the winner’s name which can now be found just outside the Rubbing House garden on the Downs. Historically there was a driveway lined by lime trees and gated by black wrought iron gates leading up to the Durdans house, which is situated on the hill adjacent to the Stables. During the First World War, Lord Roseberry is said to have locked these gates stating that he would only open them again once his son had returned from the war. His son never returned and hence the gates have never been opened since. This limetree avenue and the locked gates are clearly visible from Chalk Lane.